Milk is packed with protein, calcium and a whole host of other nutrients. For centuries it has been consumed by humans, but today, some swear by it and some are against it. 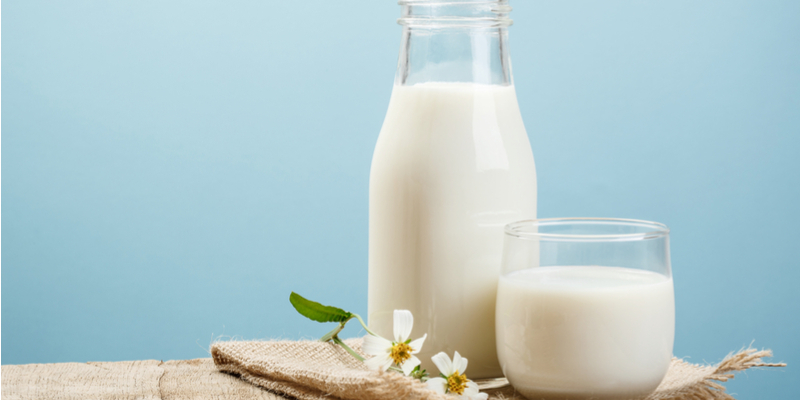 In this post, we talk about some of the health benefits of drinking milk. A good amount of evidence shows that milk has been part of the human diet for more than 8,000 years. It is a important food for good nutrition and is a necessity for the survival of many populations. In recent years, milk has come under fire. Its nutritional value has been questioned, including its hormone-disrupting, inflammation-inducing and gut-disturbing properties. Milk may not be for everybody, but it does have its fair share of health benefits! Milk (from animals, most often cows) is a liquid, nutrient-rich food formed from the combination of water, casein protein, fat molecules, lactose and vitamins and minerals. It’s a good source of protein and carbohydrates, two macronutrients which are necessary for energy production. Milk contains a smattering of micronutrients like calcium, magnesium, phosphorus, vitamins B12 and D. These nutrients have a wide range of health benefits, from strengthening bone mass, maintaining red blood cells, preserving nerve and heart health and regulating blood pressure. Strengthens your bones and teeth. Milk is rich in calcium which helps build muscle mass and strengthen the teeth. It also contains vitamin D, essential for the absorption and distribution of calcium in the body. Maintains heart health. With its high-potassium content, milk supports normal blood pressure by stimulating vasodilation and improving blood flow throughout the entire body. Eases depression and anxiety. Mood disorders are often caused by a lack of the mood hormone, serotonin. Milk is rich in vitamin D which influences the production of serotonin in the body. Builds muscles. Milk is one of the few food sources that has complete amino acids. Amino acids are the building blocks of protein and protein helps to repair and build muscles. Rejuvenates the skin. Lactic acid is a naturally occurring compound in milk that helps to remove dead skin cells. Milk is also rich in vitamin A, a potent antioxidant which flushes out free radicals and toxins. Relieves stress. Milk is good for easing stress because it contains lactium, a protein that calms the body and lowers blood pressure and also potassium, which soothes the muscles and nerves. Prevents Premenstrual Syndrome (PMS). Milk is high in magnesium content, and this mineral can regulate and balance oestrogen and progesterone. Boosts energy. Lactose in milk is considered a simple sugar, which means that it can easily be absorbed and metabolized into energy, giving you an immediate kick! Plant-based milk such as those made from soy, almond, coconut, hazelnut and rice are flying off supermarket shelves. These plant-based milks are rising in popularity because of claims that they reduce the risk of lactose intolerance and can have even more benefits than cow’s milk. The rise of alternative milk in the Australian market is estimated to be worth $150 million. This number has grown quickly in the past few years. Meanwhile, milk consumption in Australia is higher compared to other Western nations, with the average Australian drinking 105 litres of fresh milk every year. Looking for refrigerated transport in Rockhampton? We’ve got you covered. Get in contact with us today.